Hello friends! Have I told you lately how thankful I am to have you here? Well I am. I really am. I look forward to sharing with you everyday! Over the next couple of days I want to share some delicious Thanksgiving recipes with you! Last weekend I hosted Thanksgiving for our family, and I have to say that this year I really enjoyed all the cooking! I felt so inspired so I went all out with the menu. I’d like to share with you what we served up for Thanksgiving, in hopes that maybe you will find something you might like to serve your family! Press into a ball. Then split into 2. It is okay if itâs crumbly. In fact crumbly makes for a tender, flaky crust! Lay out a piece of wax or parchment paper, lightly sprinkle it with flour, then roll out one of the crusts for the bottom of the pie. Then press the crust into a 9â³ pie plate. 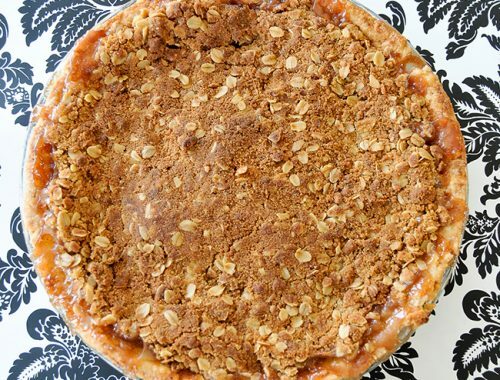 You can use the other crust for another pie, or freeze it for later. Place a piece of tin foil over your crust and fill it with dried beans or rice or pie weights. After this time, remove the foil and weights. Then reduce the oven temperature to 375 degrees and bake the crust for 5 -7 minutes more, or until the edges are dry and golden. Set the crust aside to cool on a rack, then make the pecan filling. At this time, also reduce the oven to 325 degrees. Toast the pecans for about 5 minutes, or until they are aromatic. Set aside to cool. Once the pecans are cool, chop them coarsely. Set aside. In a bowl whisk together the egg yolks and vanilla. In a saucepan combine the butter, sugar, corn syrup, cream and salt. Heat the mixture over medium heat, and stir until the butter is melted and everything is combined, but do not boil the mixture. Stir for 3 – 5 minutes. Add the pecans to the pie shell, spreading them out evenly. Slowly pour the sugar mixture over the pecans. Place the pie on a cookie sheet, then bake it in the oven for 35 – 40 minutes or until the centre of the pie isn’t jiggly. Let cool before serving…it’s best left to rest for at least 1 hour. More time is better. I was so happy with this pie I have to tell you. It was creamy and rich…and just SO good. My son even said it was his most favourite pie of all time. And this from a kid that doesn’t even like pecans. Now that’s sayin’ something! Enjoy! 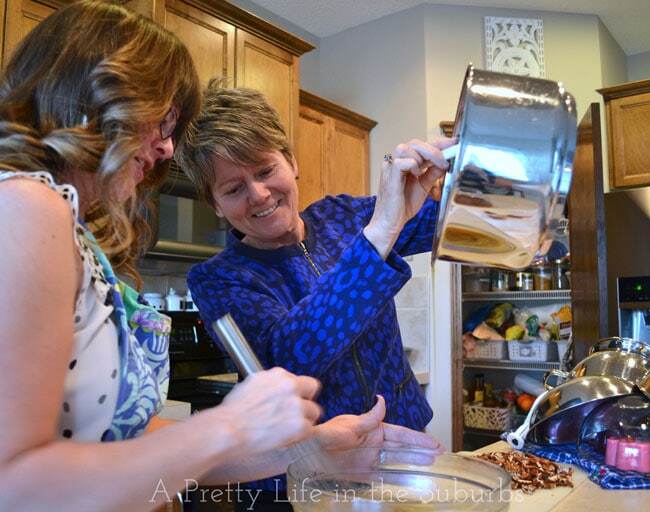 And just for fun, here’s a little action shot of my mom & I whisking, whisking, whisking! In case you are interested, here is my full Thanksgiving menu….I know, this looks like a lot, but we had quite a few mouths to feed, and honestly, I did a lot of the prep work and cooking the day before. And with the help from my hubby, sister and mom on the big day we managed to pull off a delish Thanksgiving dinner! I know this is going to sound crazy but I have never made pecan pie before! I’ve made other caramel nut tarts but we always end up just doing pumpkin pie for Thanksgiving. I think I’m missing out! That does’t sound crazy at all…I hadn’t either, but it was so easy and so worth it! Oh yummy! 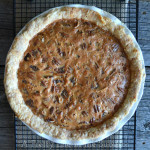 Pecan pies are my favorite, yet I have never made a homemade one! 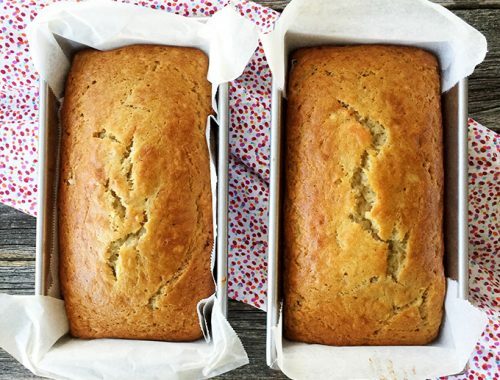 Oh you should…they’re so easy and sooooo much better home made! I’m not a big fan of pecan pie but my husband loves it! I will definitely make one for him, maybe I’ll have a slice too 😉 Pinned it so I won’t forget. 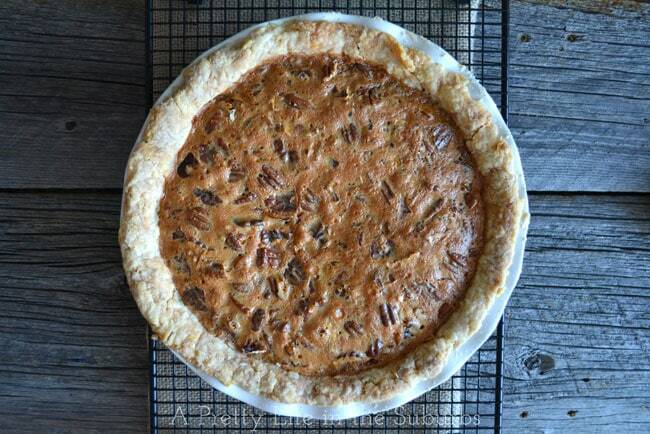 You should have a slice…there is nothing like home made pecan pie! Enjoy! And thanks too for pinning! This looks amazing! I’m normally not a pie lover, but pecan is a weakness! Thanks Shauna! I am a pie lover for sure…pecan is one of my most favourite! Your menu looks amazing! (And yum, pie is always good.) I am hosting Thanksgiving this year for my in-laws and I’m starting to stress out about it a little bit. But we only have 6 adults so we don’t need that much food. Thank you Sarah! Best of luck with your Thanksgiving dinner! I love big holiday feasts!! I guess BBQing the turkey frees up the oven for other dishes like sweet potato casserole, etc. I like your idea of doing things a day ahead, but my family usually descends upon us like a pack of locusts and it doesn’t give me a lot of time in the kitchen. I usually end up trying to do everything on the day and revert back to basics. It is disappointing because I can do so much more! Too funny! It really is hard to put together a dinner when family descends like that, lol! BBQing the turkey was great for freeing up the oven, but it took a lot longer than we thought it was, so I’m not sure I would cook the turkey that way again. But I will definitely be doing most of my dishes the day before…that was so helpful and everything tasted great!